NASA’s Insight lander that has comfortably parked itself in Mars and will spend two years exploring its surface land and environment has sent its first selfie of the region. The lander which weighs 800 pounds moved its six foot long robotic arm and aimed its camera to take a series of self-portraits. The complete photo which is a mosaic of 11 images shows the solar panels of lander and its deck which is laden with scientific instruments. Besides its surface the picture also gives viewers a vision of the dusky red soil of Mar’s surface as the lander is parked on a broad plain that is located near its equator called Elysium Planitia. The Insight has beamed back 52 photos of the environment directly around it and these have been used to create a mosaic of 4 * 7 foot region around the lander which is stark and barren with pockmarked surface is some areas. 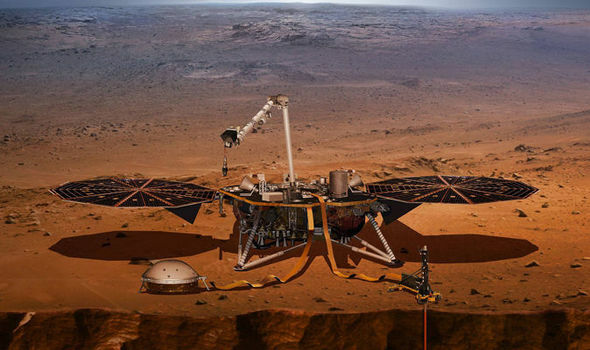 The Insight probe is not mobile like its predecessors Curiosity and others so is stuck in Planitia region which scientists joke about as the biggest parking lot of Mars. The absence of rocks, hills and craters make the region safest for instrumental landings. Insight is located 340 miles away from Curiosity which is already trundling along the surface of Mars taking selfies of its own surroundings since it landed there in August 2012 and is also explore its landing site Gale Crater. The Insight mission which cost $800 million has a long agenda to measure frequency and magnitude of quakes on Mars and study how heat from its depths make their way to the surface. Since it landed in late November, NASA’s engineers have been testing each of its onboard instruments as they are all located on its surface. This testing process itself will take around two to three months.